[New for 2014] It was day #2 without leftovers so that meant finding lunch again. I walked to Dunkin yesterday, and it's a gorgeous day again today so I should walk again, but I need to spice my lunch up today. Yes, GrubGrade already warned us that the XL-BBQ-CB was just an overpriced version of his beloved Rodeo burger, but if I'm gonna nosh, it mine as well as be on something "new". And nosh I did. It wasn't mind blowing, but it enjoyable. It had the traditional fast food BBQ sauce, a bit of crunch from the onion rings, and then some cheese to tie it all together. Nothing I would probably crave in general, but I'm happy to have finally tried it. Does it taste a bit like an orange creamsicle? No.... It tastes A LOT like an orange creamsicle! It's got that familiar taste but it's actually a bit more potent. Add that in to the fact that the texture is more like a real creamsicle as compared to say an Orange Coolatta, and we've got a fun summer treat. 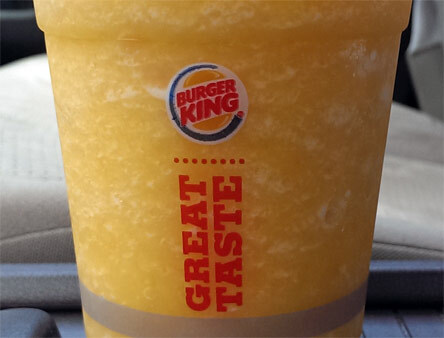 Sidebar: Why they didn't call it orange creamsicle freeze? or orange cream freeze? I don't know.... but it's probably the same reason why DD call's it an Orange Coolatta and not an Orange Creamsicle Coolatta. I have no problem recommending this drink. My only suggestion would be to treat it as more of a snack and get it with like a small fry. I enjoyed it, but I'm not really sure it went with my burger. I just read about this burger today and was curious so this is great timing. The drink looks good but I bet you are right that it would go really well with fries. Have you had the cola version? It's really good! Ok, I tweaked the wording in the post. I have had the cherry and cola ICEEs before, but this is a freeze (similar, but not identical). I love burger king! 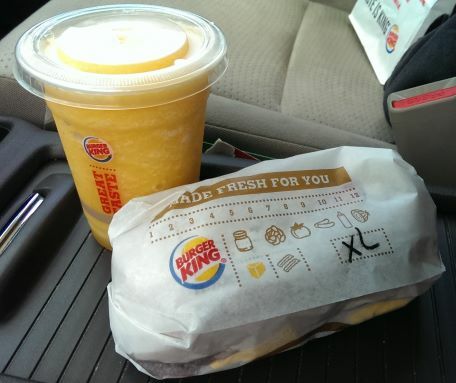 Every Tuesday and Thursday at 14h is my Burger King day! Thanks for publishing all those nice products out in the markets, is nice to know what i'm missing. I think i'll subscribe. 12 oz has 57 grams of sugar. That's more than a soda. Yuck.